One by one, the buffers between what people want and what the media can afford to deliver have been stripped away. Broadcast TV was deregulated, and cable and satellite TV arose in a wholly post-regulation era. As newspapers fell during the rise of the Internet, and fell faster because of the 2008 recession, the regional papers fell hardest. The survivors, from The New York Times to the National Enquirer, will be what British newspapers have long been: nationwide in distribution, and differentiated by politics and class. The destruction of the “bundled” business model for newspapers, which allowed ads in the Auto section to underwrite a bureau in Baghdad; the rise of increasingly targeted and niche-ified information sources and advertising vehicles; and the consequent pressure on almost any mass offering except for sports—all of these are steps toward a perfected market for information of all sorts, including news. With each passing month, people can get more of what they want and less of what someone else thinks they should have. 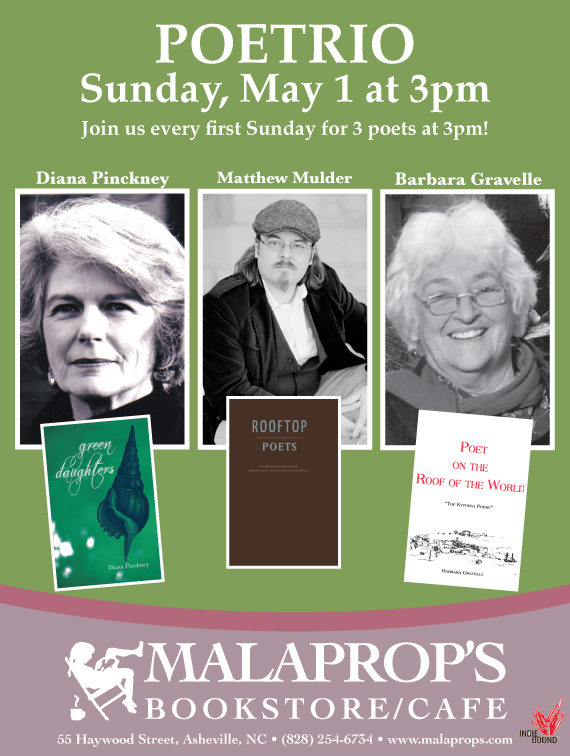 Poets Diana Pinckney, Barbara Gravelle and Matthew Mulder plan to read from their recently published books for Poetrio at Malaprop’s Bookstore/Café May 1, 2011 at 3 p.m.
Diana Pinckney has published poetry and prose in such journals and magazines as Southern Poetry Review, Cream City Review, Tar River Poetry, Cave Wall, Sow’s Ear Poetry Review, Icarus International, Atlanta Review, Green Mountains Review, Main Street Rag, Kalliope, Iodine, Asheville Poetry Review, Calyx, RHINO, Charlotte Viewpoint… Magazine, The Pedestal Magazine.com, Creative Loafing and many others. Her chapbook, Fishing With Tall Women, won North Carolina’s 1996 Persephone Press Book Award and South Carolina’s Kinlock Rivers Memorial Chapbook Contest. Nightshade Press, Troy, Maine, published her second book of poems, White Linen, in 1998. Alchemy, the third collection was published by Main Street Rag Publishing Co. in 2004. The latest full-length book of poems concerns the many fascinations and mysteries of the sea, among other things. Green Daughters was released April 2011. Barbara Gravelle, author of several poetry books including, Keepsake, Dancing the Naked Dance of Love, and her latest collection of poems, Poet on the Roof of the World. Barbara Gravelle began to publish poetry in the 1960s when she was in Detroit at Wayne State University. In 1970 she moved to Berkeley, California where her first book, Keepsake, was published by Two Windows Press. She worked with the San Francisco State NEA Poetry in the Schools program at Northern California schools. Concurrently she worked at Intersection Center for the Arts in North Beach directing the Women’ Reading Series and an experimental Feminist Writing Workshop. Dancing the Naked Dance of Love, her book of San Francisco poems was published during this time. In the mid 1980’s Barbara began to migrate to the island of Kythera in Southern Greece, while living there she wrote the poems for Poet on the Roof of the World. Matthew Mulder has published poetry and prose in such journals and magazines as Crab Creek Review, H_NGM_N, The Indie, Rapid River Magazine, ISM Quarterly, Salamander, Wander, The Blotter, Southern Cross Review and others. He teaches poetry writing classes at Asheville bookstores and fine arts centers and is presently translating selected works of German poet Rolf Dieter Brinkmann. 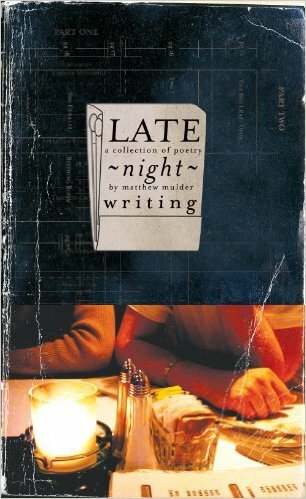 He is the author Late Night Writing (2004) and editor of A Body Turning (2010) and Tomorrow We Sweat Poetry (2009). His new poems are anthologized in Rooftop Poets (2010).